Our holiday garland features lush, full, green branches, illuminated by warm white LED lights. Wrap a banister or arrange along a mantle for a classic, festive addition to your wintertime celebration. 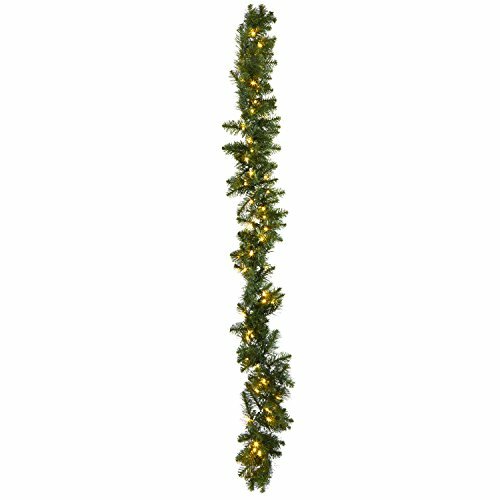 ✓ FESTIVE - Features a 9 foot lush, green faux pine garland with 100 Warm White LED lights and 1 UL plug. This pre-lit Christmas garland is perfect for windows, mantles and table top holiday decor. ✓ REALISTIC & REUSABLE - Made with an assortment of realistic pine and branch types to mimic natural pine. This garland is the perfect Christmas decoration that will impress during the holiday season and could be re-used over and over again for many years to come. ✓ CONNECTABLE - This plugin garland can connect up 3 additional strands for a larger range of coverage (connects 4 total strands) | Includes one 6-foot green lead wire. ✓ CUSTOMER SATISFACTION GUARANTEED - LampLust is looking for you satisfaction. Please contact us through seller messages for all questions or concerns. This Pre-Lit Pine Garland has a 90-Day Warranty.